Bob Stefanowski campaigning at an office park in Shelton. 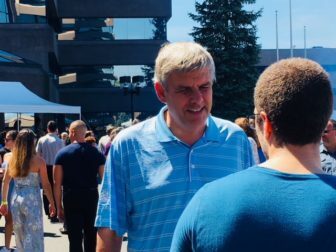 A band played as a casually dressed Bob Stefanowski shook hands with office workers at the annual pre-Labor Day picnic that real-estate developer Robert D. Scinto throws for tenants and their employees at his hilltop office park in Shelton. Then Stefanowski retired to a borrowed office in Scinto’s headquarters to make calls for money. Stefanowski, 56, the political newcomer and former financial services executive who won a five-way Republican primary for governor, contributed $2.3 million to his campaign, raised $634,000 from others and accepted the GOP nomination on Aug. 14 having pretty much spent it all. Until the holiday weekend, Stefanowski had not had a public schedule. The question now is how much more can he give? And how much can he raise? He was the only candidate in the GOP primary who made Republicans nervous about his ability to compete financially in the general election against Democrat Ned Lamont, a self-funder who contributed $17 million to his U.S. Senate campaign in 2006. If one of the three publicly-financed candidates won, they would have been handed $6.5 million from the state’s Citizen Election Program. The other candidate was a hedge-fund founder whose self-funded campaign spent $6.3 million on the primary and had another $6.7 million in the bank, ready for an immediate round of television advertising. Is Stefanowski good for another $2.3 million — or more? Stefanowski won the nomination as a complete outsider, bypassing the state GOP convention and qualifying for the primary by petitioning. 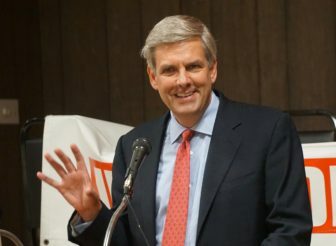 In addition to fundraising, Stefanowski has been courting his former rivals and other elements of the GOP establishment. Leora Levy, a Republican National Committee member from Greenwich, has signed on as his finance chair. He recently addressed the Republican State Central Committee, making jokes at his own expense. Shelton Mayor Mark Lauretti, who failed to qualify for the primary at the convention, greeted him at Scinto’s picnic. They talked about playing golf. Maybe nine holes, first thing some morning, Stefanowski suggested. A TV reporter last week asked Stefanowski about his absence from campaigning. He replied that his schedule would be busier and regularly shared with reporters. Over the weekend, it included stops at several agricultural fairs and marching in Newtown’s 57th annual Labor Day parade. The calls for money also would continue. “We’re going to get a lot of help nationally,” he said. Scinto is among the local supporters trying to raise money. Scinto, 71, is a developer whose business survived the real-estate bust of 1990 and a philanthropist whose reputation survived a guilty plea in 2010 for lying to the FBI about gifts he made to Shelton officials. He was not accused of seeking anything in return. Connecticut’s economy is at a tipping point, Scinto said, and Stefanowski’s focus on controlling state spending and cutting taxes to promote business growth makes him an attractive candidate. But the experience of Tom Foley, the GOP nominee in 2010, suggests the money won’t come easily. Foley was the U.S. ambassador to Ireland under George W. Bush, a post that rightly marked him as a major fundraiser for the Republican Party. He was part of the GOP fundraising network, and he lives in Greenwich on Connecticut’s Gold Coast, a region often considered to be a campaign ATM for Republicans. Even with his fundraising experience and connections, Foley only managed to raise $1.6 million for his own gubernatorial campaign, which ultimately spent $12.6 million in a razor-thin loss to Democrat Dannel P. Malloy. The other $11 million came from Foley’s pocket. “I fully intended to raise more, and I thought I’d be able to raise more,” Foley said. He said several factors undermined him: The network of big GOP donors is more attuned to federal elections; Connecticut’s campaign finance laws discourage people in the financial services industry from contributing to state campaigns; and once a candidate is seen as a self-funder, many potential contributors look elsewhere. Stefanowski could find his previous generosity to his own campaign to be a problem with other donors, Foley said. “When you have written your own checks to get you to a certain point, people will say, ‘Wait a minute, am I really going to write a check for $2,500?’ ” he said. In 2014, Foley participated in the voluntary public-financing program, then urged his donor network to give to the state party, which can accept contributions of up to $10,000. Unlike super PACs, the state parties can legally coordinate with state candidates. Foley said he helped raise close to $3 million for the state party in 2014. Unquestionably, money is available to support the election of a Republican governor in Connecticut. Less clear is how much of it will fall under the control of the party’s nominee, who can accept contributions of no more than $3,500, versus super PACs that have no legal restrictions on how much they can raise or spend as long as they do not coordinate with the candidate. Two super PACs are supporting Stefanowski with independent expenditures: Change PAC, which is funded by the Republican Governors Association, and Protect Freedom Political Action Committee. The RGA gave $350,000 Change PAC over the weekend, bringing its total investment to $1 million. Protect Freedom has spent more than $1 million, mostly on television ads. The latter has a very generous donor: Reverge Anselmo of Greenwich, a writer and movie producer who has given $3,500 to Stefanowski’s campaign — and at least $730,000 to the PAC. Stefanowski has a base of about 85 donors who gave the maximum of $3,500 for the primary, including Scinto, whose company owns four million square-feet of office space in dozens of buildings, mostly in the Bridgeport suburbs of Shelton and Trumbull. Donors can give another $3,500 for the general election. Scinto already has. Editor’s note: Quoting campaign finance reports, this story originally reported Anselmo’s contributions to the Protect Freedom as $1.4 million. Amended reports changed the number to $730,00.